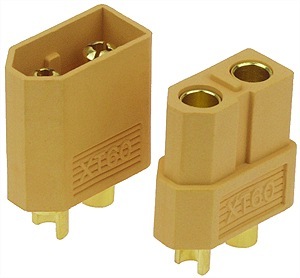 Set of one male and one female XT60 wire connectors with gold plated contact terminals. Rated for 60 Amps continuous duty. Solder connection terminals on back side of the connectors. The male terminals are spring loaded for a tight and secure fit. XT60 connectors have a very high current rating for their compact size, can not be plugged together in reverse polarity, and hold up very well in both on-road and off-road electric vehicles where strong and repeated vibrations are commonly encountered.